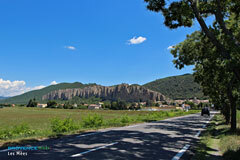 Coming from the south : A51 highway, exit Les Mées-Peyruis, then take the N96 and the D4. Coming from Digne take the N85 then the D4. 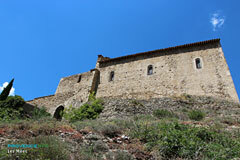 The village of Les Mées owes its notoriety to the narrow rocks rising up more than 100 metres high behind the town. These are known as the "Pénitents des Mées" because of their silhouette. As legend has it, they represent the monks of the Lure mountain who were petrified (literally) by Saint Donat during the Saracen invasions as punishment for falling in love with the beautiful young "Mauresques" women that a feudal lord brought back from a crusade. 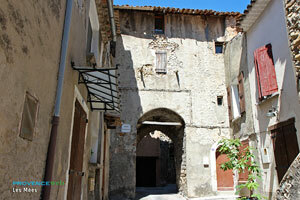 The village is situated at the foot of the narrow rows of the "pénitents". 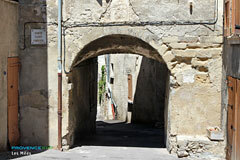 In medieval times, the village was enclosed by a rampart and the remains of the gate-ways can still be seen today ("porte St-Christol", "porte Baudouine", "porte Bertrand de Bras"). 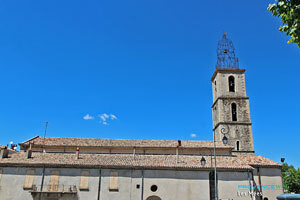 You will also notice the primitive village church ("église Saint-Roch") built on the foundations of a Roman monument. 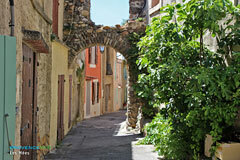 To admire the village from above, a very pleasant promenade takes you to the top of the "pénitents", (departure point from the camp site on the D101). 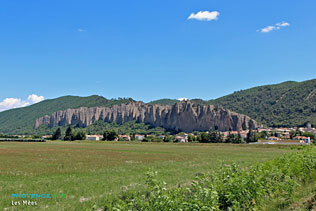 Les Mées is the district in the Alpes de Haute Provence which possesses the largest number of olive trees. The olive oil is known for its quality and has won numerous awards... ! Olive mills: Moulin des Pénitents and Moulin Arizzi. Cultural events during July and August.